This is important and well documented information about the Communist infiltrators in America. The infiltration isn't as subtle as one might think, the information is readily available for researches and journalists to discover. The Problem is of course, journalism is dead in America, as that was among the first institutions they infiltrated. - W.E. 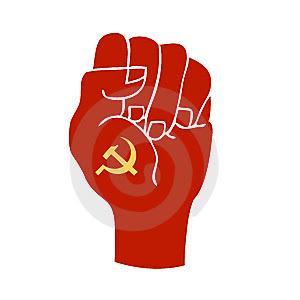 Communist Party USA plans to infiltrate and manipulate the Democratic Party can be illustrated by direct quotes from Communist Party literature. "Our electoral policy has for 25 years been expressed in the phrase, 'the three legs of a stool'....The stool was constructed at a time when the Party was under sharp attack....a reflection of the Party's response to the difficulties. The flexibility was contained in the idea that no one leg of the stool was the main leg. Depending on the political pressures, one could choose a particular leg or legs. In fact the concept was built on the idea that when the other two legs, namely, the Communist Party and the forces of political independence, got strong enough, then and only then would the stool sit on three legs. But until that day comes the one operating leg would be the liberal wing of the Democratic Party." Hall, writing this in 1972, at that time claimed that he had decided the policy was wrong. It is apparent, however, from later quotes and actions of top Communists, including Hall, that the policy was in fact been continued and even augmented. "We are going to work towards independence, but I think it is clear we are going to work with people who for some time will be 'riding two horses' in the field of political action." "To date, most of the debate has centered on the personalities of potential Black candidates and the pros and cons of such a challenge. The thrust of such a candidacy must be to develop the popular electoral base to prevent the Democratic Party from continuing its shift to the right and force a more progressive platform and program in the 1984 campaign." Should the party strive to play a leading role helping those forces gain and consolidate new positions of strength, even inside the Democratic Party or shouldn't it?, I think it should. How is our party going to develop its all-sided electoral presence? This cannot and should not repose solely on Communist or Left-independent candidates. Not if there is any intention of emerging as an integral component of the overall progressive coalition. especially in view of the fact that the Jackson-led progressive wing of the Democratic Party is that coalition's major organized. component." Beyond the rhetoric, politics in the United States invariably reflects the class struggle. Even as parties of capitalism, the dynamics between and within the Democratic and Republican parties express the interests and demands of competing sections of the ruling class, on the one hand; and cross-purposes of contending class forces vying for control of the Democratic Party, on the other. During the Reagan-Bush years the Republican Party has become the party of the ultra-Right. Organized forces of the working class and people are almost totally absent from it. For the last fifty years the Democratic Party has housed a broad mix of class and social forces that are often in conflict with each other. This has given rise to a sometimes subtle, sometimes sharp struggle over direction. The status and intensity of this struggle depend on the level and strength of the political independence of the labor movement and other people's forces operating inside the (Democratic) party. Organized mass movements, especially the African American community, the Rainbow Coalition, labor on all levels, SANE-Freeze, and other mass organizations- became more independent of the Democratic Party establishment on policy and political direction. but more organizationally involved in the Democratic Party. This much is clear - the overall movement will grow. So will the role of the Rainbow Coalition and the labor movement. And it will unfold in the 1989-1992 quadrennial cycle primarily, but not exclusively-through the medium of the Democratic Party. In the late 1980's Communist Party USA publications also specifically described a party apparatus for directly influencing the votes of Congress and even Congressional and Presidential Elections. This is called CPLAN, or the Communist Party Legislative Action Network. This network was organized to influence other mass organizations cooperating with the Communists through the "All Peoples Front" to stimulate telephone networks and letter writing campaigns to influence Congress on legislation and even to reach voters regarding election campaigns. Every party organization should assign a comrade to be in touch with the legislative and political action department of the Central Committee. This could be a key for rapid mobilization. The aim is to activate within a day or two all party organizations, as well as our mass movements connections, to pressure their Senators and Representatives. . .
CPLAN is an important means of strengthening the unity of the independent forces, and this could have a great bearing not only on the l00th Congress but on the 1988 electoral struggle. When account is taken of the Party district and club organizations, as well as the thousands of trade unions, coalitions, and mass organizations on the grassroots, citywide, and national levels that Communists belong to, help lead, are active in, have friends, relatives, and contacts in, then the answer as to how to organize a Party legislative apparatus, as well as the Party's potential for influencing the legislative scene, become clear. . .the basis for an extraordinary legislative action network that could impact on the l00th Congress in a major way. In a speech given at the Peoples Weekly World ’s Better World Awards banquet in New York City, May 17, 2009, entitled "the impossible becomes possible", Communist Party National Chair Sam Webb, explained the possibilities opened up under the Obama administration.